John Demos: Koala Tie, Drawing Tools, Name Tag. Family and friends of John, you are invited to leave a message below with your memories of him. So sad for your loss, Will miss John on campus, his cheery smile and the fact he always called me Maureen. May he rest in Peace. I’ll miss you John. I always enjoyed our chats and have so much respect for the enthusiasm and energy you had for your art and for life. Both one and the same. You were a very special person to a great many people and will be greatly missed. 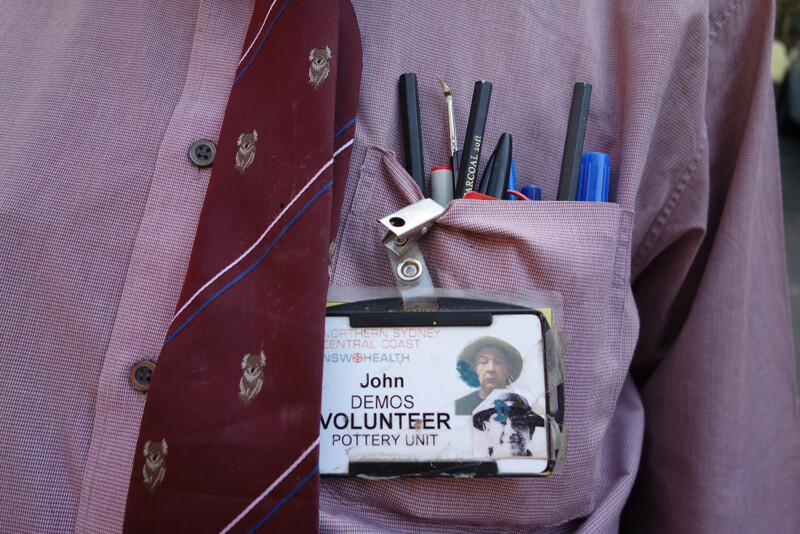 I only got to know john briefly but I still have fond memories of his friendliness, enthusiasm and of course his amazingly vibrant apron and how he use to stuff his shirt pocket to the brim with assorted art supplies. John was a great artist and even greater human who has left a positive impression on all of us. My thoughts are with all his friends and family on such a great loss. Much love. Miss you Costa. We had so many things we were going to do. It was a privilege to know John and spend some time with him at the Big Fag Press. My heart goes out to John’s friends and family in this time of loss. One of my favourite memories of John is from a day when I was walking from the light rail station at Jubilee Park. I saw the doors to the BFP were open and could hear the radio playing from inside. As I walked past I saw John sitting inside, drawing. He was so absorbed by his work that I didn’t disturb him to say hello, just thought how perfectly happy he looked, sitting there working in a place that he loved. In December 2005 Helene Nolte, Macquarie Hospitals then pottery teacher, pointed out a rather dapper chap standing in the corner of a room at a farewell party for the Director of Macquarie Hospital. It was funny that she’d pointed him out, as I’d spotted him when I walked in. My eye was drawn to his quirky outfit . . . a ‘girl’s school’ hat, pens in pocket and white zinc all over his nose. He looked like he was about to head off to a cricket game in the stinking December heat. Little did I know that this man was once quite the athlete! ‘That’s John Demos’ she said. ‘I’ve worked with him for many . . . many years and he’s a great potter Kris’. It wasn’t until April 2006 that I actually got to meet John Demos. He’d wandered up to the pottery studio from the Hobby Unit to introduce himself and to offer his services to help with wedging clay, packing kilns and general amiable chit chat. He said that he’d always helped Helene out with pottery stuff and hoped that he would be able to continue now that I was running the studio. I didn’t fully realise it then, just how important this man would become to me and to so many others . . . John is an artist, a poet, storyteller, philosopher, a true gentleman, gardener, potter, carpenter and a great equaliser, and most importantly a very dear friend. John had a long association with both Gladesville and Macquarie Hospitals over the years. He’d connected with Helene at the original pottery studio at Gladesville where he worked alongside her developing creative and technical skills that would see him study ceramics at Medowbank TAFE in his 20’s. . . then become the ceramic technical assistant at the very same TAFE. John was a master thrower . . . he said to me ‘In my younger days I threw very large pots . . . very big pots Kris. Big big pots!’ then came his well-known amused chuckle. A chuckle with that look in his eye . . . I’m sure you all know the one. John was well loved at Macquarie Hospital by many . . . from the executives to security staff. He loved the Hobby Unit, a carpentry studio, facilitated by an Irish joker named Jack and two amazing women, Clare and Juleyn, who were always his mates. John experimented in this space with a variety of materials that gave form to his 3D works and access to equipment. John was able to extend this experimentation into the Art Resource studio where he worked prolifically in 2D. Ever the eternal friendly chap, he made friendships with the art therapists and artists that worked in that space . . . including Clare, Dimity and Juliet. In this space he produced some of his major works and techniques that we are so familiar with today. In 2007 Juliet Fowler-Smith and I curated an exhibition at Hornsby TAFE Gallery that included works by John and other key artists, including Kevin Meagher and James Ackhurst. It was here that John met Colin Rhodes, the Dean of Sydney College of the Arts. I remember watching the two of them fully engrossed in conversation about art and where John’s ideas came from. In 2010 John was invited by curator Hugh Nichols, to be a part of an exhibition called Unseen Ways, at Macquarie Uni Gallery. This key exhibition and friendship between artist and curator, began to cement John as a key emerging contemporary artist with a valuable practice, in Sydney. Invited by Colin Rhodes to have a solo show at Callan Park Gallery at SCA in 2011. John had free reign over one of the gallery rooms to create an amazing installation and to exhibit other works that he’d most recently produced. He was also included in the Accessible Arts Art Boxx Framing Gravity exhibition that saw Hawkesbury Regional Gallery commission John to produce his work ‘creation’ for the show. Again in 2012, John had a solo exhibition at the Insideout Gallery at Macquarie Hospital and it was at this key exhibition that John meet Lucas Ihlein from Big Fag Press, this meeting came about through, Josie Cavallaro from Accessible Arts. 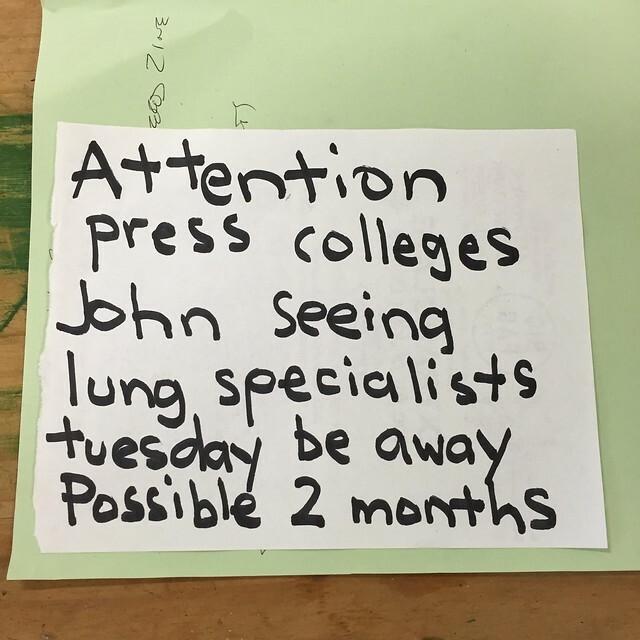 John was successful in receiving a professional development grant from Accessible Arts to work in an artist residency at the Big Fag Press in 2013. 2013 was a massive year for John as he connected with the Big Fag crew including Lucas, Tim, Diego and Lou, and with all the artists and creatives that frequented the Big Fag and the Firstdraft Space. Also that year he worked with filmmaker Daz Chandler to produce a short film ‘The Count of Rookwood’. John’s artistic achievements blossomed, but so did his friendships. We spent so much time together and along for the ride our other Musketeer, Kevin Meagher. Regular Yum Cha, exhibition viewings, bumping in and out exhibitions, working together in the studio and just generally hanging out all led to a deep friendship and love for one another. John had an incredible capacity to make friends in high places . . . like the security guards at the AGNSW. He often got a free viewing of major exhibitions before the doors were even opened. He was reminiscing one day about how security had let him in to see the Frances Bacon exhibition without anyone else in the space. I was tots jealous! He told me that in his younger days he was living homeless on the grounds of one of Melbourne’s universities, where he wandered the libraries and made friends with some of the library and science faculty staff. He said to me that he was often invited into the science labs to look at what they were doing. He said that these connections and experiences fed his creative practice. You can most definitely see this in his work – be it the Deans, Dewey Decimal System, the test tubes, formulas . . . a questioning of life, the universe and everything! What a craft he had in winning trust from unlikely places and also that he placed great trust in others . . . in you and me. John talked often of his past, of his beloved sister Christina and of the pain, and beauty that he’d experienced throughout his life. His storytelling entrapped and entwined you with his being, and there are so many beautiful narratives. For me his ‘ingenious chalk eyes’ will always shine bright in my heart. He is embedded in my soul. My Dear John, I miss you and love you . . . love always Brains. It’s such a shame to lose you, John. You were (you are) an amazing artist and wonderfully warm human being. It was a pleasure to spend time with you, and an honour to be able to exhibit your work. Rest in peace, and let’s all work to make sure that your art lives on. I met John Demos in October 2012. Josie Cavallaro was at that time working for Accessible Arts, expanding opportunities for artists with disability to move beyond the standard channels of art therapy, outsider art, and mental health. It was Josie who first cooked up the idea of an alliance between John Demos and Big Fag Press. Around the time I met him, John spent most of his days at Macquarie Hospital, at a supported studio called Project InsideOut, where Kris Tito was manager. I made a studio visit to meet John and Kris, and was blown away by the quality of John’s work. We became friends very quickly, and I was honoured to be invited to launch John’s exhibition at Macquarie Hospital gallery in November 2012. I distinctly remember my first impression of John’s artworks – which I (incorrectly) read as part of a concrete poetry tradition. They had a kind of textual poetics where the graphics and layout are as much a part of the meaning of the work as the words themselves. Kris and John collaborated with Diego Bonetto, Louise Anderson and me to put together a grant application for a 3 month “mentorship” residency. The idea was that John would spend one day per week in the Big Fag print workshop, make some new work, learn some new printmaking skills, and expand his network in the wider artworld beyond the hospital context. Happily, John was awarded the grant for the mentorship. But there were two things about our original proposal that never quite eventuated. First, the idea that we would “mentor” John turned out to be laughable – he was twenty years the senior of our most senior member, and had been practicing art for longer that the entire life of our most junior member. We had so much to learn from John. As Louise wrote at the time, “John has a determination, work ethic and dedication to the arts that is unheard of to me”. If this was a mentorship, then it was clear that the mentoring flowed both ways. The second thing that never really eventuated was the idea of a “3 month residency, one day per week”. The thing is, by the time 3 months had passed, John had settled in. He became part of the bustle of the Woolloomooloo First Draft Depot building, where Big Fag Press was housed. He far exceeded the budget that had been allocated for Kris Tito to accompany him on his Big Fag days, and began showing up almost every day. In the end, this was the big success of his residency – that he didn’t need Kris to come along with him any more, and begun to operate as an independent artist within an artist-run network. By the end of the 3 months, John, with the help of Louise, had begun negotiations with gallery director Jo Holder towards a major solo exhibition showcasing the work he produced at the Big Fag. John had pumped out a staggering amount of work – prints, drawings, collages – during this time, but of course only a small amount of it could go on display at The Cross Arts Projects. The exhibition was accompanied by a wonderful short documentary film produced by talented young media artist Josh Charles (one of my former students from Wollongong Uni) who was able to create a space for John to speak on the record, on his own behalf, about his own work and his place in the artworld. Around the time of the launch of John’s exhibition at The Cross Arts Projects, the Big Fag Press crew played a role – again thanks to Kris and Josie – in a high profile symposium at the MCA focusing on the importance of the supported studio network in creating a scaffold for artists with disability, so that more aspects of the artworld might be accessible to them. I remember being so proud of Louise Anderson that day, as she stepped up alongside John and spoke confidently about her experience of their collaboration, and eloquently discussed the complex politics of representation and disability in the arts. Working with John forged Louise’s passion for grassroots cultural leadership, and I am certain that she will recall this relationship as deeply formative in decades to come. When the time came for us to move the Big Fag Press out of Woolloomooloo, we began to sense that John was going to be with us “for good”. Shifting the press to our new digs in Glebe was a major logistical operation. John offered to help, and by the time all our equipment was safely installed in Viaduct 4, and John kept “showing up to work” each morning with Diego at seven, we began to think of him as an equal member of the Big Fag collective, rather than someone who had simply done a residency with us. John had his own key; he ran errands; met with visitors and became firm friends with our neighbours at the Men’s Shed; made endless cups of tea and noodles; smoked way too many cigarettes; drew and painted with Albie May; relentlessly washed up and scrubbed our filthy sink; and produced a vast number of drawings. Last year, we convened a “Big Fag Press corporate retreat” at Bundanon. John was there, and Clem, and Little John, and Louise and Diego and I. We had a warm and wonderful time cooking together, walking, drinking coffee in the sunshine, stressing out about our finances, and hamfistedly concocting future marketing schemes to keep the press afloat. Big John (as we now had to call him, since the arrival of Little John) was present throughout it all. We are a family to each other, each of us with his or her own quirks, difficult histories, foibles and special skills – all gathered around an improbably heavy printing machine which these days, in the economic reality of things, doesn’t really deserve to still be running. But we love that machine, and we love each other – and we loved Big John so much. On January 28 this year, Diego arrived at the press to discover a note written by John. A bit more than two months later – on April 9th – John died in Greenwich Hospital. The lung specialists had found extremely advanced lung cancer. They tried chemo briefly, but soon gave up, and from then on his medical care concentrated on keeping him as comfortable as possible as the inevitable happened. During this time, while visiting John in hospital, and afterwards, while helping to clear out his little flat in Gladesville, Albie May and I have gotten to know John’s sister Tina and her partner Sean. From Tina, we’ve begun to understand just how resilient and relentlessly positive John had been throughout more than forty years of struggle with severe chronic schizophrenia. Only in the last decade has John found a degree of peace in daily life, thanks to a combination of new drugs, and possibly with the slowing down of age. But without Tina’s constant love, John may have ended up living rough, or having a terrible accident. She is truly a remarkable, loving sister. Through spending time with Tina, I’ve also come to realise how incredibly lucky we’ve been at Big Fag. Along with his time with Kris at Macquarie Hospital, we shared the very best years of John’s life: years of productivity, pleasure, and camaraderie – and in the case of the three and a half years that we’ve known him, these were years when he was able to operate as a professional artist in the artworld among a wide network of creative practitioners, most of whom knew nothing in particular about his medical condition. This was his ultimate achievement – that he had begun to move beyond the mental health arts framework that had supported him for so long. John, you were a brilliant artist and a wonderful man. We learned so much from you, and as we begin to unpack and explore your archives, I have no doubt that there will be many more discoveries to come. So much was said with so few words. So much warmth and humanity towards others. Thanks for your generosity of wisdom, ideas, insights and time. It was such a pleasure being in your company-it was an honor to know you.